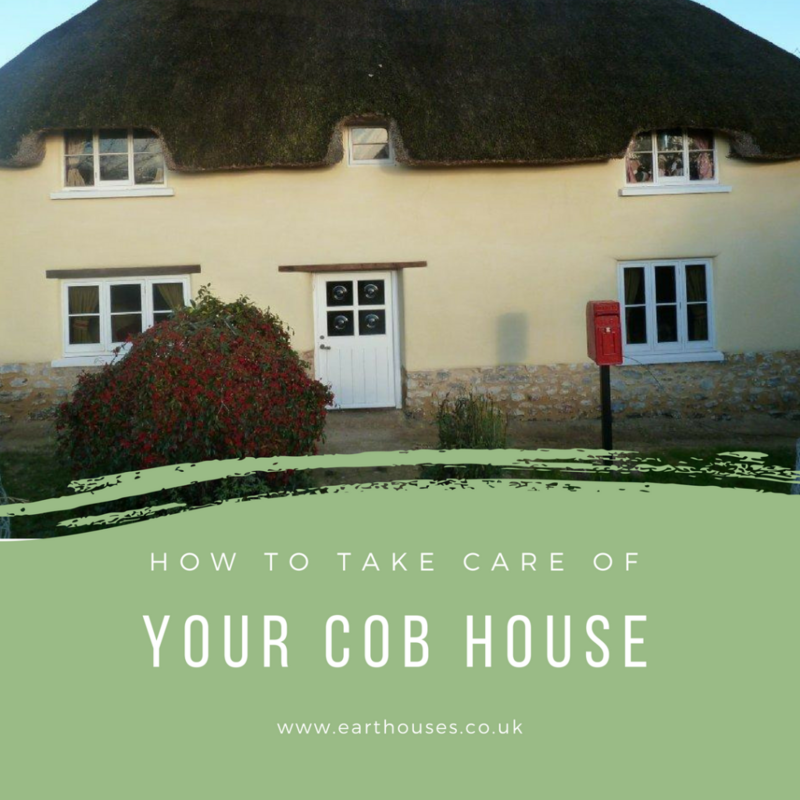 We talk a lot about restoring cob and lime buildings on this site – probably because by the time Earthouse has received a phone call, there is already a problem! In this blog we are going to talk about maintaining your building so that you do not get to this point. Unfortunately, if you can see the problem, it generally means there is something underlying. In the worst cases we have seen, this has been severe damage due to complete deterioration of the cob structure. The most common reason customers contact us is to say that there is a crack in their plaster, or a damp patch has appeared. When we hear this, we know that the issue will be that a cob or stone wall has been rendered using modern cementitious render. Modern cementitious renders have their place; on modern buildings with a damp course and effective air circulation systems. They were never meant to be used on cob or stone walls and consequently cause problems. The damage is almost always caused by water ingress. Modern cementitious renders are waterproof; this means that if water somehow gets in it cannot escape, so it remains within the structure and moisture builds up over time. The frost and thaw process aggravates this deterioration, resulting in the cob degrading into a topsoil-like substance. 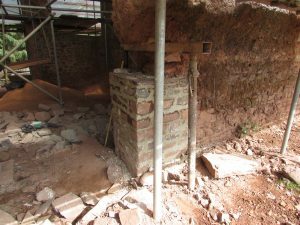 However, cob buildings if treated correctly can last for hundreds or even thousands of years; as long as you are prepared to spend money putting right what previous generations have got wrong, there is no reason your building cannot last for a similar timespan. In addition to this, conservation officers will no longer allow you to render cob in sand and cement, as this does not conserve the integrity of the building. As a cob and lime specialist, if we can see cracking or damp on your walls, we will assume that there could be issues with the underlying cob. 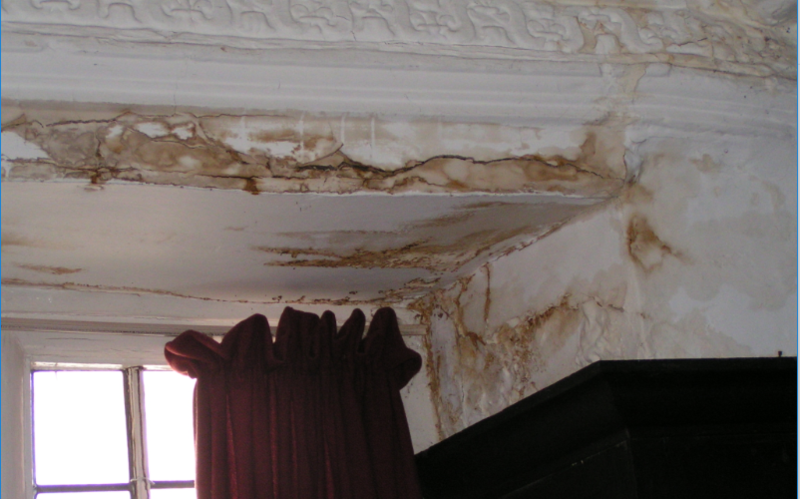 They may also say that they cannot diagnose the extent of any damage without being able to see beneath the plaster. As a guide, if you have excessive or large visible cracks to the render, you should expect a number of cob repairs. Whilst it is straightforward to give a cost for lime rendering per square metre, it can be difficult to provide a quotation for remedial cob work. Generally Earthouse advises customers to allow a 15-20% contingency for cob repairs, although this may differ depending on the situation. There is no steadfast way to deduce the state of the cob without taking the render off; we have worked on properties where the render looks fine, but the cob is really badly affected underneath. Conversely we have taken off badly damaged render expecting the worst, only to find that minimal cob repairs were required. If you have a cob property there are things that you can do to maintain the integrity of your building. Prior to buying a cob property, you might consider asking a cob and lime specialist to accompany you on a site visit. If the property has been rendered in anything other than lime it may be that you can negotiate on the price, as ideally you would re-render the house. If you suspect a cob property has been plastered in cementitious materials, ask the surveyor to confirm the render material and the paint used. 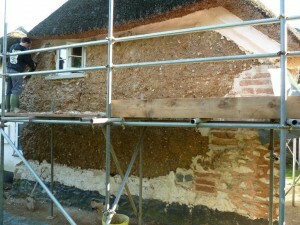 If your house is cob, always consult a builder that has specialist knowledge of cob and lime render. Remove aggressive creeping plants at the earliest opportunity as they can damage structures. Be aware that any plant or tree that touches the building can affect the render negatively, particularly if it is windy. Damaged or blocked guttering is probably the most common cause of water ingress; check your gutters and ensure they are cleared regularly. Thatched houses tend not to have guttering; ensure there is an alternative way to drain excess water away from the house, for example via a French drain soakaway. If you have anything other than lime render on your walls we would suggest that you remove this internally and externally. If you have a cob property, this will then need to be re-rendered in lime based products. Stone or brick properties without a damp course will need to be treated with lime based mortars throughout. If removing the render internally and externally throughout the house is not an affordable option, it may be that there are key areas that you could restore to prevent further damage. Use the correct decoration on walls that have already been lime rendered. We recommend lime wash or you could choose one of the excellent silica based paints internally. Externally you also have the option of using a casein distemper or a clay based paint. Please see our blog Lime Wash vs Silica Paint for more detail. If you decide to use lime wash, bear in mind that you will need to re-decorate within 3-5 years to maintain your aesthetics. Finally if you are concerned about your property, please contact us. We are able to provide free advice about the best way to approach any remedial or preventative work.